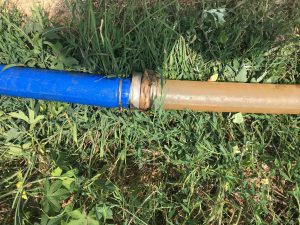 In the use of 3” PVC layflat hose, sometimes because of improper operation or external causes of its blockage, most of the reason is the river, lake, pool and other 3” PVC layflat hose containing sediment and organic matter caused by the blockage, when this phenomenon when we need to take Some of the corresponding measures to solve. 3” PVC layflat hose dredge can use the pressure to clear the way with compressed air or pressure 3” PVC layflat hose rinse drip irrigation system, the effect of blocking the organic matter is good, but this method is not effective for carbonate blockage. You can also use acid rinse method for calcium carbonate precipitation, available 0.5% to 2% hydrochloric acid solution, with 1 meter head pressure into the drip irrigation system, the solution retention of 5 to 15 minutes. When it is blocked by calcareous clay, it can be rinsed with sand acid rinse. The previous article：How to use and manage Agriculture PVC layflat hose?